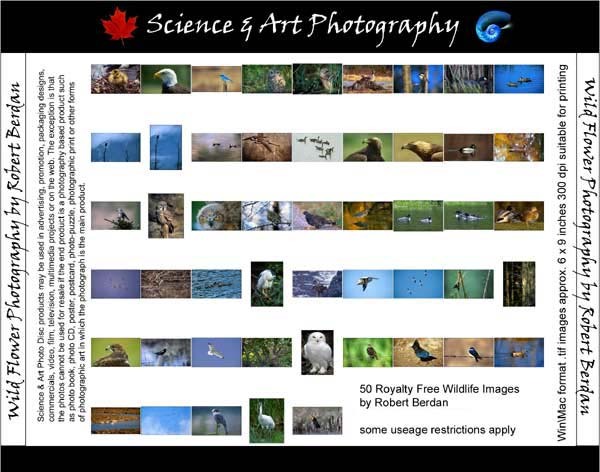 Robert Berdan is passionate about nature, science, and wildlife photography. His professional experience includes photojournalism, various type of scientific photography and virtual reality imaging. 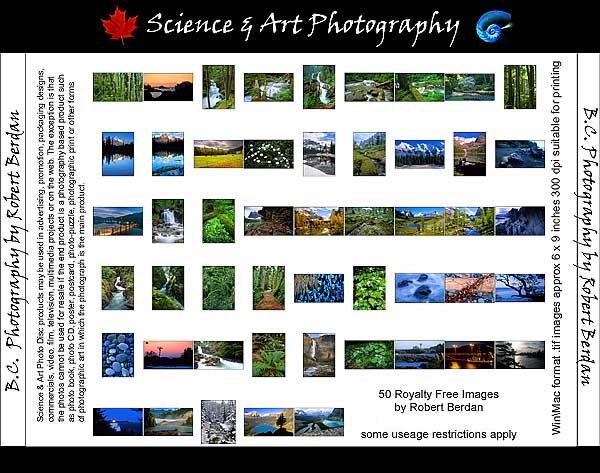 His photos have been on the cover of scientific journals, magazines and his images have won international awards including Banff International Mountain Photo Contest and Nikon International photo contest. 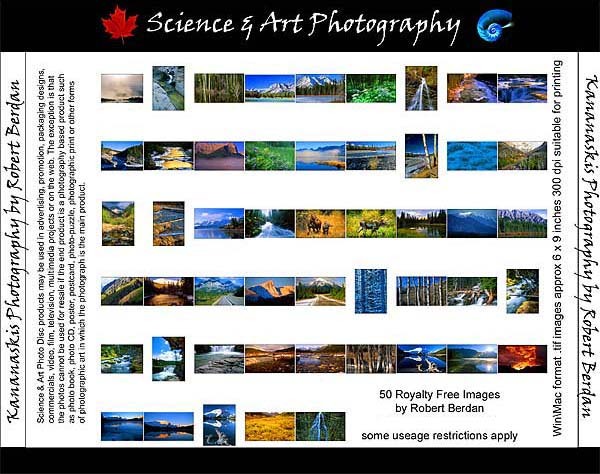 Recent publications include Photo Life and Canadian Geographic. Robert shoots with 35 mm, digital and 4 x 5 large format cameras. 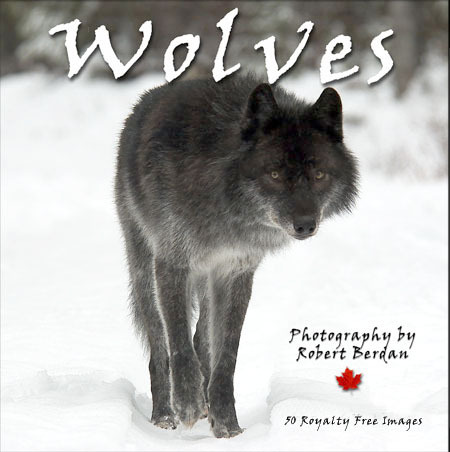 Photo CDs by Robert Berdan may be used Royalty Free in advertising, promotion, packaging designs, commercials, video, film, television, multimedia projects or on the web. In advertising or promotion, in any medium; as part of a packaging design; as design elements on products for resale, including books and games; in commercials, television, film or video. The one exception is that the photos cannot be used for resale if the end product is a photography based product such as photo book, photo CD, poster, postcard, photo-puzzle, photographic print or other forms of photographic art in which the photograph is the main product. The use of images for photo based products must be negotiated on an individual basis. For all other purposes there are no additional charges based on quantity of printed items, number of products for resale, or circulation of materials. 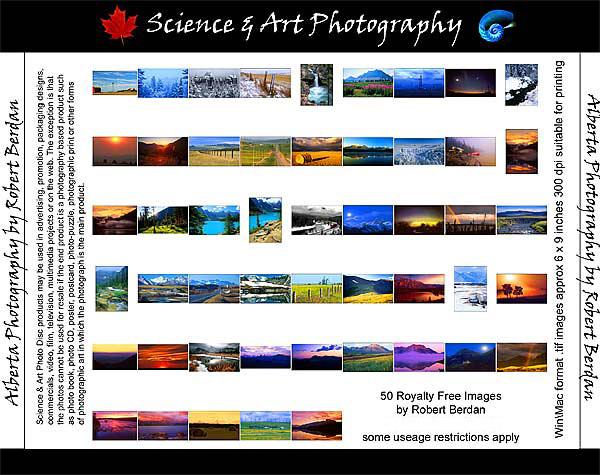 A few restrictions on use of Science & Arts images are outlined below. If you have questions or concerns about the use of any images please contact us for clarification. suitable for printing, multimedia and the web. 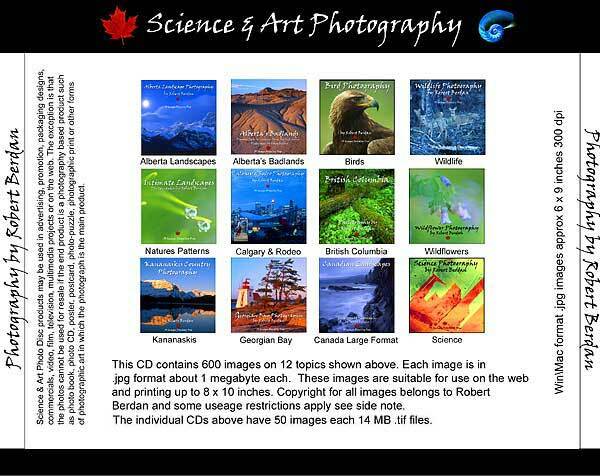 9 x 6 inches by 300 dpi .jpg files all on one CD! 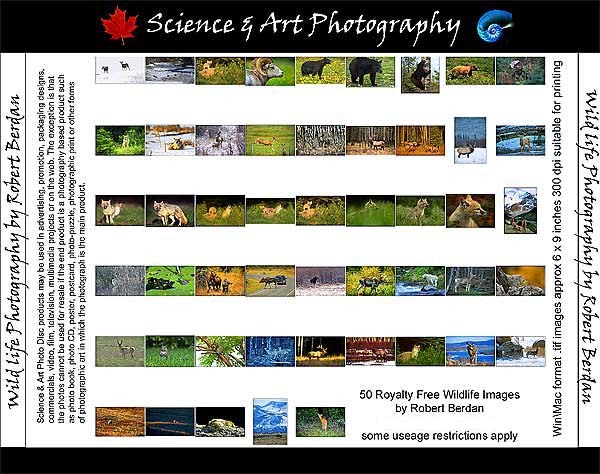 The images are from Alberta Landscapes, Alberta Badlands, Wildlife, Birds, Natures Patterns, Calgary and Rodeo, Wildflowers, Kananaskis, Georgian Bay, Canada Large Format and Science. 50 Images of wolves taken in Blaiberry Valley near Golden, BC, Canada..
50 Images in total from various locations around Alberta, including Banff National Park, Waterton National Park, Pincher Creek, Paradise Valley, Moraine Lake, Morant's Curve, Oldman river, Beauty Creek, Northern Lights, Lake Louise, Vermilion Lake, Banff Springs Hotel, Vimy Peak, Castle Wilderness, Dogpound creek etc. 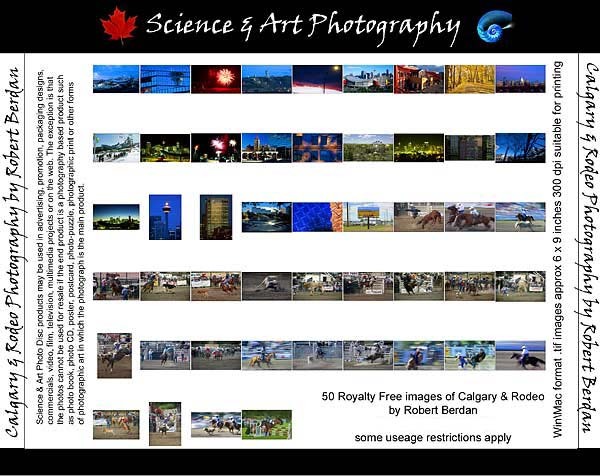 50 Images in total, 20 from Dinosaur Park, 20 Writing-on-stone, 10 from Red Rock Coulee, Alberta. 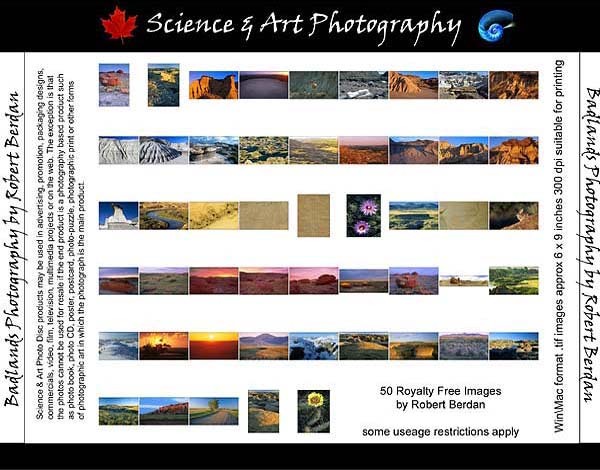 Images include: sunrise, sunset, pteroglyphs, panoramic photos, cacti, mudswallow nests, winter scenes, hoodos, giant concretins, mud rills, deer, and a dinosaur bone execavation. 50 Images in total including a wide variety of birds including: Great Horned owl, gray jay, stellar jay, blue heron, boreal owl, snowy owl, bald and golden eagles, woodpecker, night heron, osprey, pine siskin, teal, canada geese, mallards, blue bird, red hawk, seagul, sparrow, red winged blackbird, yellow headed black bird, pelican, trumpter swan, grouse, burrowing owl, whooping crane etc. 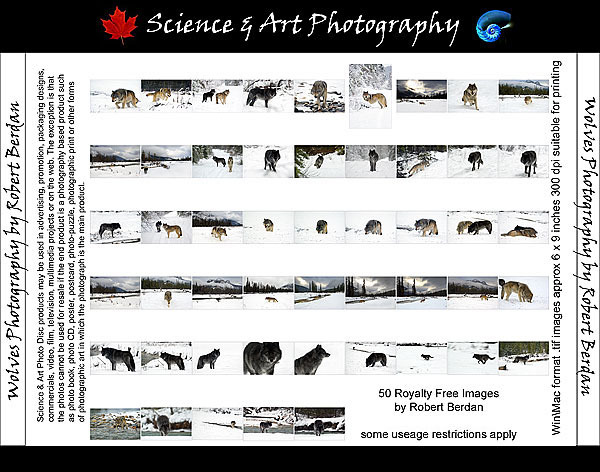 50 images of wildlife taken mostly in Alberta in all seasons including: swift fox, moose, white tail deer, mule deer, hoary marmot, pika, elk or waputi, coyote, leopard frog, mountain goat and red squirrel. Each image is 14 MB in size (approx. 9 x 6 inches x 300 dpi) suitable for printing, multimedia and the web. 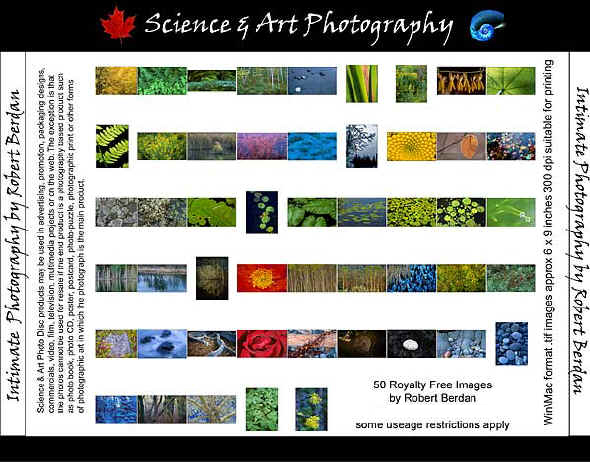 50 Images in total including closeups of lily pads, stones, ferns, daisy, corn, leaves, grass, moss, lichen, spider web, razor clams, pine needles, seaweed, ice crystals etc. 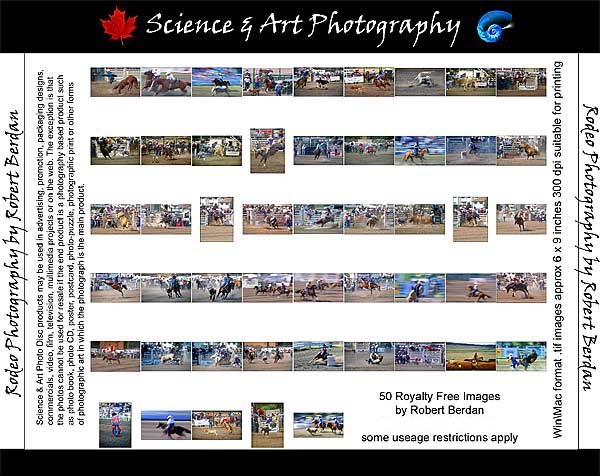 50 Images in total including scenes of Calgary at night, chinook, autumn walkways, Canada olympic park (COP) and various Rodeo images most were actually taken nearby at the Cochrane rodeo. 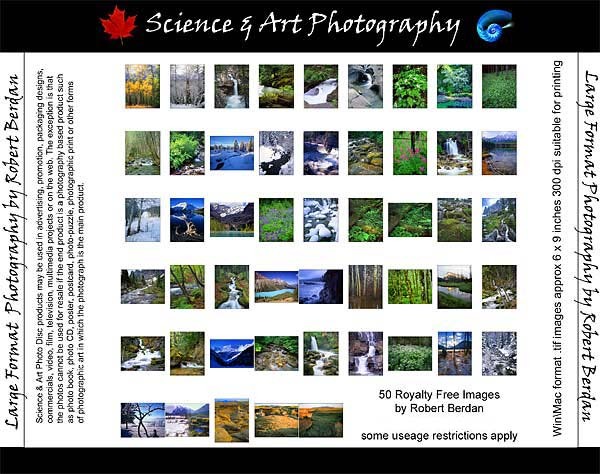 50 Images in total including scenes of the temperate rainforest, west coast, Vancouver Island, Mystic bech, Uclulet, Yoho National Park, Lake O'hara, Kootenay National Park, Crowsnest Pass, Takakkaw Falls, Nakusp, Gardner Creek Falls, Begbie creek and falls etc. 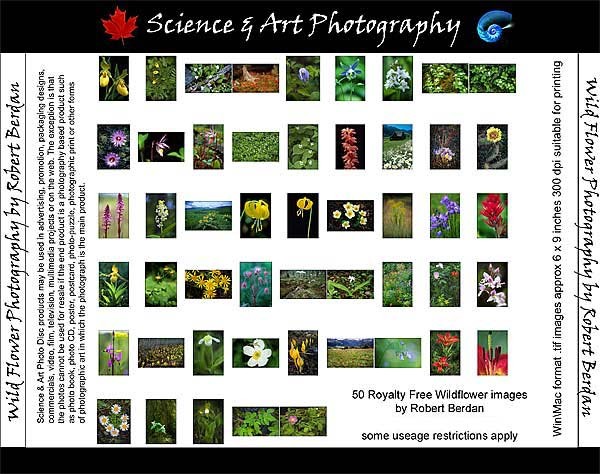 50 images of various wildflowers most taken in Alberta and few in British columbia including: shooting stars, trillium, old mans whishers, lungworts, townsendia, calypso orchids, lady's slippers, canada violets, skunk cabbage, glacier lily, coral root orchid, globe floers, indian paint brush, harebell, queens cup, blue clematis, buckbean, gallardia, elephant head orchids, bunch berry, golden rod, canada anemone etc. Each image is 14 MB in size (approx. 9 x 6 inches x 300 dpi) suitable for printing, multimedia and the web. 50 Images from Kananaskis country and provincial park in Alberta including moose, sheep river falls, upper lake, lower lake, highwood pass, sarrail creek and falls, elbow river and ralls, black prince and the spray lakes area including Mt. Worthington etc. 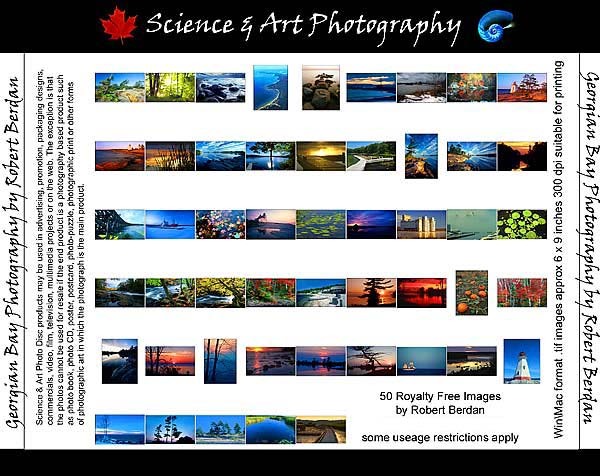 50 Images in total including scenes of Midland, Wye Marsh, Bone Island, Brebeuf lighthouse, Western Island lighthouse, Tiny Marsh, Alqonguin Park, Oxtongue river, Go Home Bay, Balm beach, grain elevators, Hog Bay Trestle in Port Severn (no longer standing) etc. 50 Images from various parts of Alberta, British Columbia and Ontario including Banff National Park, Writing-on-stone, Lake Louise, Vermilion Lake, Peyto Lake, Point no point, Slocan Falls, Opapin plateaur in Yoho National Park, Marble Canyon, Kananaskis, White cap creek, Gardner Creek Falls in Nakusp, Dog Pound Creek, Paradise creek, Sarrail creek, Clutest park, Begbie creek, copper creek, Vermilion Lake, Mount Rundle, temperate rainforest, Waterton National Park, Oxtongue river etc. Each of these images was taken with a large format camera using a 4 x 5 inch slide that recordsremarkable detail. The texture of the moss and individual blades or grass can be easily seen and appreciated. 50 scientific images taken with light and electron microscopes and telescopes. Images include crystals using polarized light, interference microscopey to view flat worms, rotifers, daphnia, spiro gyra and various other microgoranisms living in poind water. There are also several closeups of insects such as tiger beetle, moth, water tiger, dog flea. 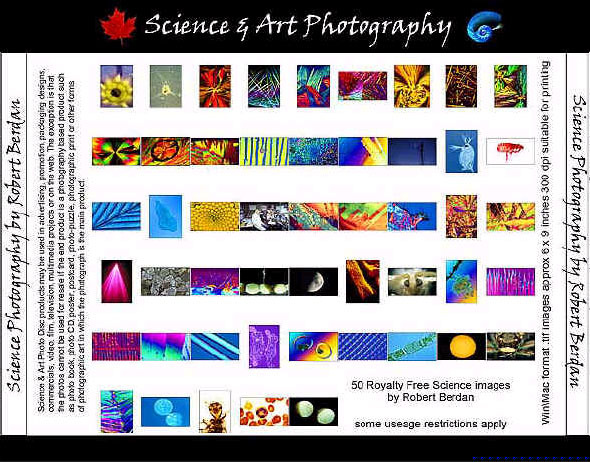 Other images include white blood cells, laser light, mosquito probosics, polar bear hair, caffeine, pine wood, snail embryos the sun, the moon and a comet. The woman in the laboratory (Donna Berdan) is my wife posing as a scientist in my laboratory at the University of Alberta. All of fhese images exhibit remarkable designs and colors.